I do not know if you, or anyone, still are there here... If you're reading this, the answer is yes! thanks for wait me! There have been a few changes in my personal life and I not had time even mood to connect me here. Surely many of you have done some beautiful works in this time, right? I wish I can go slowly reconnect with my readers and followers. I return to track your blogs and maybe I will not leave comments, but I will say that I'm back here, attentive to everything that happens. Thanks again for wait! but I still not had done the snack bag. Well, here it is! to make the backpack of Carlota. Do you remember? Here you can see again! in the next time I will see if I put it well! but, well, it is relatively easy to make a bag. But I need a day whole to do one bag like this! hahahaha! other things that I have done. And I will to show you the garden and ... well, see you soon! I acknowledge that my musical tastes are quite varied. That all depends on the mood. I can listen to folk, pop, rock ... if the song is good no matter what musical style. I'm of extremes in this sense. This song has already many years but I must say that I love ... I love listening .... thousand times ... you know this song? This song it define how I feel at the moment and has been present in other hard times in my life. I inform to you: from now when you put comments you will need put the code letters. I'm already tired of the comment spam! yeeeeeees.... ads of all kinds! until one day I see announcing a machine to enlarge the apparatus of men ... you imagine what kind of comments? So, I've decided to reduce these types of comments. And from now you will put the code . I'm sorry, I hope that this is not too much trouble for you! Thanks again for wait! Hola Cristina, si que feia molts dies que no sabia res de tu, inclús vaig pensar en enviar-te un mail per si estaves bé. Ara ja està me n'alegro que estiguis bé. Espero que aquests canvis a la teva vida siguin a millor....i si no temps al temps. Una fortíssima abraçada!!!! Hi Cristina! It's been a long time since I saw for last time! 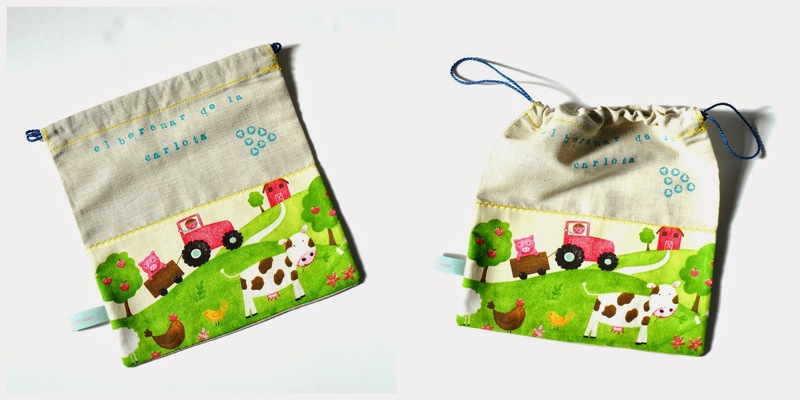 The snack bag is very beautiful and I like very much the animals that the fabric has! Hope to see you again. Look forward to see what you have to post from what you did these months!! Niki! No saps que contenta estic de retrobar-te en aquest món virtual. Ja s'ha tornat a encendre la teva llum per als qui has estat, ets i seràs una guia en el món de la llana. Benvinguda, t'he trobat a faltar!! M'alegro molt que tornis per aquí, ja m'estava posant trista per no poder veure les coses boniques que fas!!! Jo també m'estic toda una tarde per fer una bosseta!!! jajaj , no se com s'ho munten les que poden fer una manta en una tarde!!! Petonets, per a tu i la Carlota. Welcome back Cristina!!!!! You were missed a lot!!!!! Bienvenida cristina!! me alegra mucho volver a verte por aqui, la bolsa es muy bonita! Benvonguda Cristina! Me n'alegro molt de que tornis a ser per aquí. T'hem trobat a faltar. Hola Cristina ¡¡ Bienvenida de nuevo y espero que estés bien tras los cambios. 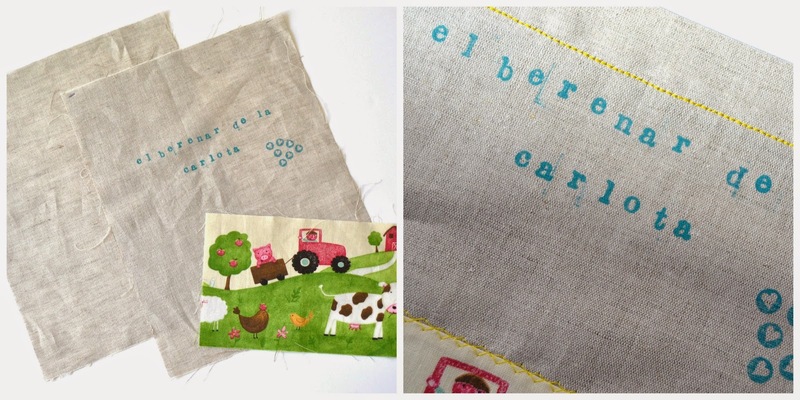 . .
Yo también tengo algunas novedades que podrás ver en mi blog, me he decidido a abrir tienda en Etsy, es pequeñita, de lanas pero bueno todo era el lanzarme a ello. Va despacio pero bueno también tengo dejado mi blog últimamente, hay otras prioridades en la vida !! Guapaaaaa benvinguda!!!! Se't trobava a faltar!!! Ànims i a bloggejar s'ha dit.